Hello! 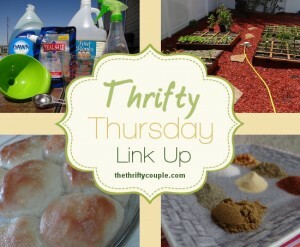 And welcome to the 143rd Thrifty Couple Link Up Party. WOW! 143. And I don’t know about you, but I have signed up for some amazing ideas and organizers through this link party. Every week I learn something that I’d like to think makes me a better mom, wife, and teacher. We meet here every week and share our amazing ideas, tips, and crafts and recipes. We really get into it here..and so many times there arises a weekly theme. This week it looks like our theme is saving money, spending money WISELY, and getting organized in our lives. All worthy goals. The ideas shared this week were super handy. And there were a bunch of them…130 links to be exact! Wow! « How To Flip Thrift Store Clothing To Make $30 Per Hour: One Mom’s Story Who Has Found Success! Happy Thursday, thanks for hosting and thanks for featuring me! Have a great weekend!